ERA cloud based smartphone alarm system with GSM phone call alert or app notification when alarm is triggered. Works with Alexa, Google Assistant and Lightwave. Timed arm/disarm via the HomeGuard Pro App. GSM phone call alerts with up to 5 stored numbers. Optional email alerts when alarm is triggered. Connect up to 50 sensors and 10 remote controls. The ERA HomeGuard Alarm series are a range of smart home security alarms designed to give you ultimate control of your home security. The intuitive wireless system has been designed with DIY in mind ensuring no wiring or running cables in walls or under the carpet and you won't need the services of a qualified electrician. Each HomeGuard alarm is also compatible with Lightwave smart products. The ERA HomeGuard Smart Alarm Pro - Junior Kit is a cloud based, wireless smart alarm with integrated Wi-Fi connectivity and SIM Card holder. The system is operated via a smartphone app and can also be armed and disarmed with one of the included remote controls. When the alarm is triggered, a loud 93dB siren will sound from the alarm hub to alert others of an intruder and the system will also alert you via phone call or app notification. This alarm kit also includes a wireless solar powered external siren box which produces an 110db siren. The system can store up to 5 emergency phone numbers, in case of a triggered alarm, and will call each stored phone number in sequence until the alert has been answered. The Junior Alarm Pro includes five components but can connect up to 50 sensors and 10 remote controls, allowing you to customise your alarm system to suit your property and lifestyle. The HomeGuard Smart Hub is the heart of the alarm system and is both Wi-Fi and GPRS enabled. The hub connects to your home broadband via Wi-Fi and links each wireless device on your alarm system. In the event of a power failure, the system automatically switches to the GPRS network. The pet friendly sensor activates when larger movement is detected making it ideal for homes with one small pet (less than 20 - 25kg). The detector should be placed in the corner of rooms that are vulnerable to intruders . When the alarm is armed an infrared sensor will detect any larger movement and activate the loud alarm siren. 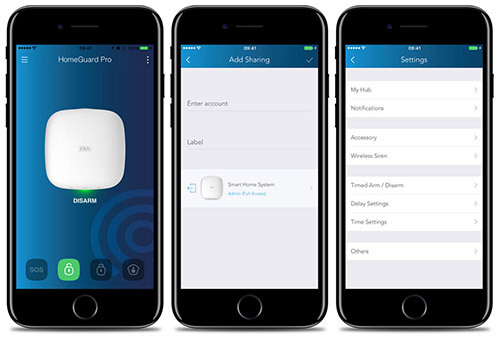 All ERA HomeGuard alarms are compatible with Lightwave smart products, providing full control of lighting, heating and power solutions via your smartphone, for the perfect smart home experience. The alarm system includes a built-in SIM card holder and can store up to five individual telephone numbers and will send call alerts when the alarm is triggered. * Requirements: This alarm system requires a Wi-Fi broadband connection or a standard sized SIM Card (Excludes Three network). SmartPhone must be iOS 7.0 and above or Android 4.4 and above.